The first official definitive Romanian stamps were issued at the beginning of 1865. The stamps were inscribed "POSTA ROMANA", and they were valid throughout all the United Principalities of Romania. The three definitive stamps shown at the top of this page, featuring the portrait of Prince (Domnitor) Alexandru Cuza, were prepared in late 1864, but they were never officially placed in use. Even though the Scott catalog does not list them, they are common in the philatelic marketplace today, and they are very inexpensive. The four portrait definitive Romanian stamps shown above were issued in January 1865. They are lithographed, unwatermarked, and imperforate. The 20 Pa. denomination comes in two types, and both of them are featured in the illustration above. On the Type I stamps, the central oval does not touch the frame at the bottom. On the Type II stamps, the central oval touches the frame at the bottom. The common design features a portrait of Domnitor Alexandru Cuza. The Scott catalog attributes, for stamps that are on white wove paper, are as follows. 02 P. (1865 - Sc. #22) - Orange, Yellow, Bister. 05 P. (1865 - Sc. #23) - Blue. 20 P. (1865 - Type I - Sc. #24) - Red. 20 P. (1865 - Type II - Sc. #25) - Red. The Scott catalog attributes, for stamps that are on bluish wove paper, are as follows. 20 P. (1865 - Type I - Sc. #24a) - Red. 20 P. (1865 - Type II - Sc. #25a) - Red. The Scott catalog attributes, for stamps that are on white laid paper, are as follows. 02 P. (1865 - Sc. #26) - Orange, Ocher. 05 P. (1865 - Sc. #27) - Blue. 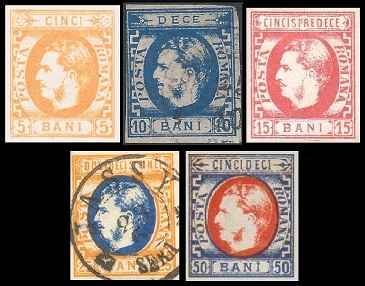 The four portrait definitive Romanian stamps shown above were issued in 1866 and 1867. They are lithographed on tinted wove paper, unwatermarked, and imperforate. The 20 Pa. denomination comes in two types, and both of them are featured in the illustration above. On the Type I stamps, the Greek border at the upper right goes from right to left. On the Type II stamps, the Greek border at the upper right goes from the left to the right. The common design features a portrait of Domnitor Carol. The Scott catalog attributes, for stamps that are on thin paper, are as follows. 02 P. (1866 - Sc. #29) - Black on Yellow. 05 P. (1866 - Sc. #30) - Black on Dark Blue, Black on Indigo. 20 P. (1867 - Type I - Sc. #31) - Black on Rose. 20 P. (1867 - Type II - Sc. #32) - Black on Rose. The Scott catalog attributes, for stamps that are on thick paper, are as follows. 02 P. (1866 - Sc. #29a) - Black on Yellow. 05 P. (1866 - Sc. #30b) - Black on Dark Blue, Black on Indigo. 20 P. (1867 - Type I - Sc. #31b) - Black on Rose. 20 P. (1867 - Type II - Sc. #32a) - Black on Rose. The four new portrait definitive Romanian stamps shown above were issued between 1868 and 1870. They are lithographed on white wove paper, unwatermarked, and imperforate. 02 B. (1868 - Sc. #33) - Orange, Yellow. 03 B. (1870 - Sc. #34) - Violet. 04 B. (1868 - Sc. #35) - Dark Blue. 18 B. (1868 - Sc. #36) - Scarlet. The four new portrait definitive Romanian stamps shown above were issued in 1869. The common design features a portrait of Domnitor Carol, without a beard. 05 B. (1869 - Sc. #37) - Orange Yellow, Deep Orange. 10 B. (1869 - Sc. #38) - Blue, Ultramarine, Indigo. 15 B. (1869 - Sc. #40) - Red. 25 B. (1869 - Sc. #41) - Orange & Blue. 50 B. (1869 - Sc. #42) - Blue & Red, Indigo & Red. 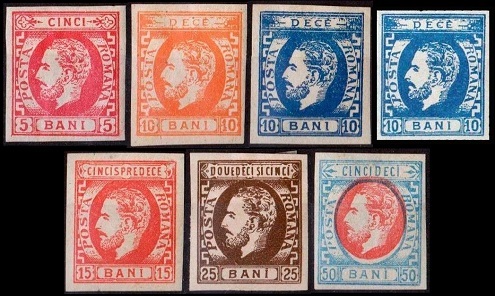 The seven new portrait definitive Romanian stamps shown above were issued between 1871 and 1872. These stamps are imperforate. The common design features a portrait of Domnitor Carol, with a beard. 05 B. (1871 - Sc. #43) - Rose, Vermilion. 10 B. (1871 - Sc. #44) - Orange Yellow. 10 B. (1871 - Sc. #45) - Blue. 10 B. (1872 - Sc. #48) - Ultramarine, Greenish Blue. 15 B. (1872 - Sc. #46) - Red. 25 B. (1871 - Sc. #47) - Olive Brown. 50 B. (1872 - Sc. #49) - Blue & Red. Scarce varieties of Sc. #44 and Sc. #48 exist on vertically laid paper. The three portrait definitive Romanian stamps shown above were issued in 1872. These stamps are perforated 12 1/2. 05 B. (1872 - Sc. #50) - Rose, Vermilion. 10 B. (1872 - Sc. #51) - Blue, Ultramarine. 25 B. (1872 - Sc. #52) - Dark Brown. 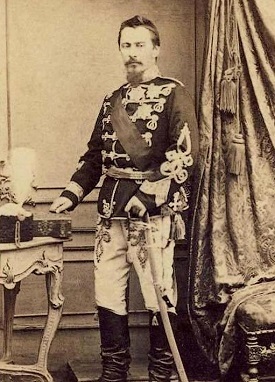 Alexandru Ioan Cuza of the House of Cuza (1820-1873) was the Prince of Moldavia and Wallachia from 1859 to 1862 and the Domnitor of Romania from 1862 to 1866. He was a prominent figure in Moldavia, during the Revolution of 1848. As the Domnitor of Romania, he instituted reforms that modernized Romanian society and improved the infrastructure of the Romanian state. A coup d'état, on the morning of February 22, 1866, forced Prince Cuza to abdicate, after which he fled the country. He spent the remainder of his life, living in exile in France, Germany, and Austria. He died in Germany, and his remains were returned to Romania for burial. Karl Eitel Friedrich Zephyrinus Ludwig of the House of Hohenzollern-Sigmaringen (1839-1914) was the Domnitor of Romania, as Prince Carol, from 1866 to 1881 and the King of Romania, as King Carol I, from 1881 to 1914. He was elected the Domnitor of the United Principalities of Romania on April 20, 1866, following the overthrow of Domnitor Alexandru Cuza. 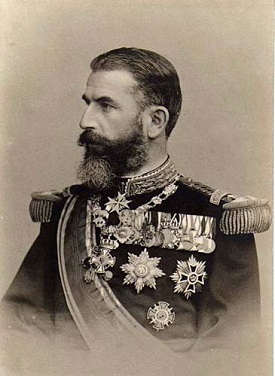 Carol personally led the Romanian troops during the Russo-Turkish War, and following the independence of Romania from the Ottoman Empire, he was proclaimed king. His family would continue to rule Romania, until the declaration of the republic in 1947. During his 48 year rule, he raised Romania's prestige in the World, and he was instrumental in rebuilding the Romanian economy. When Carol died in 1914, he had no male heirs, so the line of succession finally went to his Nephew, Ferdinand, who then became King Ferdinand I of Romania.